... Morton & Associates is a Palo Alto-based, full service professional accountancy corporation founded in 1980 by Jack Morton, Ph.D., CPA. The firm provides a broad range of accounting, auditing, tax, and related planning and consulting services to fully and properly serve individual, business, and non-profit clients. Together, our clients represent a distinctive cross section of the residents, businesses, and human services organizations in the Bay Area. History. Since our founding in 1980, we have built our reputation on our strong technical knowledge of accounting, together with an unwavering commitment to exceptional and personal client service. In addition to the many individuals and businesses we have served, we have built a special expertise working with not-for-profit organizations. As we enter upon our fourth decade in practice, we are particularly proud of the long-standing relationships we have enjoyed with so many of our clients. Capabilities. Our highly trained, experienced staff maintain their expertise with a high level of on-going education and training in current accounting practices and their respective areas of specialization through programs offered by professional organizations and those provided in-house. 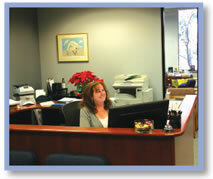 Their skills are complemented by our state-of-the-art accounting software and systems. As a result, our staff is fully current on tax and accounting regulations and any requirements that affect our clients. Because of our long-standing, on-going work and experience with a wide variety of non-profit organizations, we are uniquely well qualified to provide accounting services for this area. Certifications. Since our founding, we have been licensed to practice in the State of California. We fully comply with and are current with all applicable Board of Accountancy requirements and the guidelines established by the American Institute of Certified Public Accountants, which includes a quality review of our financial statement preparation procedures. These reviews are conducted by teams of independent CPAs to ensure that all professional standards are fully, completely, and professionally met. Please see the Contact Us page for helpful links.